During my career as a technology specialist, and more so as a production manager, I’ve seen so many challenges when it comes to keeping track of material approvals. Typical material approvals aren’t the issue. Most PLM’s have the ability, out of the box, to track and approve many different aspects of materials, such as quality approvals, color specific approvals like lab dips and strike-offs, and testing approvals. However, when you try to take those approvals and apply them to a style’s Bill Of Material (BOM), in order to get a true picture of where you are, things tend to get a bit murky. If you ask most apparel companies if they would like to have data at their fingertips, which helps them ascertain if all materials for a particular style are approved, they would of course say “yes”. Having this information would highly benefit a product development team by identifying a major milestone in the style’s production readiness. However, our experience is that few companies compile this data. Why? Well the means to accomplish this is via the BOM, and as we all know, specific materials can be on many BOM’s. Now add the complexity that approvals typically occur at the material and material color level, and these materials may be sourced from various suppliers, and you can paint a picture in your mind of how many “moving parts” are associated with this quest for a BOM approval. Intellimas provides the end user with an experience similar to using Excel®, but it’s a true application, with a database and a configuration engine, which allows you to build repeatable processes, while merging in company specific business rules. In our example below, I will discuss how you can use Intellimas to roll up the material approvals to a BOM approval, and then to an overall calendar approval. First, the materials. Material tracking can occur at a variety of levels; material level, material/supplier level, material/season/supplier level, material/year/supplier level or any combination or permutation thereof. Using Intellimas, you can have your cake and eat it too! You can set up approvals at the levels you need in order to specify what materials are approved, what supplier the approval is for, and what season/time period for which the approval is valid. 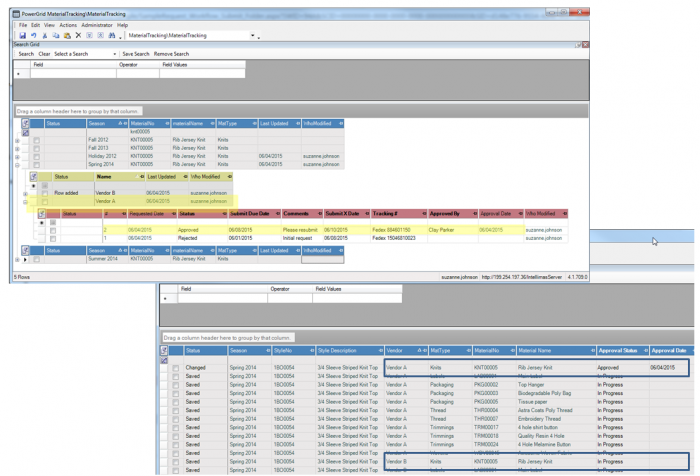 These approvals may be done in your PLM system and fed to Intellimas or can be done in Intellimas itself, in various material tracking entities. The next part is one of the two areas that seems to be omitted from PLM’s, manufacturer specific BOM’s. If your vendor is supplying your product on an FOB or LDP basis, you’re going to ask them to purchase all the materials, nominated or not, on your behalf. And you are at least going to want to approve the nominated materials and the approval must be done for the specific supplier of the material. 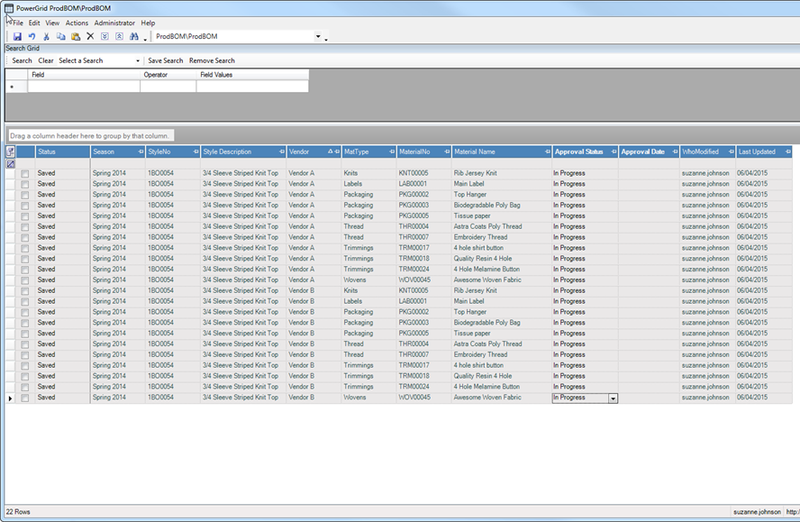 So if your PLM system does not easily allow you to create BOM’s by manufacturer, Intellimas can create that structure. We need a way to capture your ‘allocation’ of each style to a particular manufacturer(s), either in your PLM system or Intellimas. Once you determine your allocation, we can join the PLM BOM with that allocation and this provides you with a real time BOM in Intellimas for each manufacturer. Then we allow for the selection of the supplier on each component for all manufacturer BOM’s (or have it default based on business logic). Either way, the goal is to have each BOM joined to an allocation so that you can have specific approvals for each style manufacturer, and then roll up the various material approvals to each BOM component, based on the supplier. The result is a bird’s eye view of the BOM by manufacturer and all of its associated approvals. Since Intellimas is database driven, this information would then allow you to manage the BOM approval process by exception, as well as set up alerts for late approvals. The next challenge is getting an overall status for all styles in general. We feel the best way to do this in the apparel industry is with a Milestone Tracking entity in Intellimas. Workflow Tracking only gives you a partial picture of your product development process and sometimes requires the manual completion of many tasks to complete a process. A good milestone tracking utility bubbles up your data to the style and season level, if done correctly, and gives you more complete visibility into bottlenecks and delays. But even style milestone tracking can be challenging because you may be trying to capture those BOM approvals we discussed earlier, which is a one to many relationship. For example, many fabrics can make up a style but when ALL those fabrics are approved, your milestone for Fabric Approval on that style should be considered complete. That roll up seems to elude most PLM systems. Never mind the daily occurrence of a new fabric being added late to a BOM,…Or what happens if your allocation changes? Those edge cases are what we handle best. 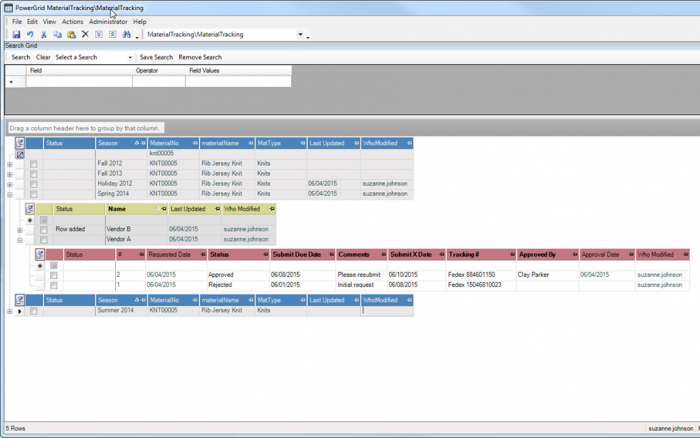 Intellimas takes all of the lower or same level approvals and rolls them up to the Manufacturer BOMs and Milestone Calendars via messages that are triggered by various actions at the approval source. This seamless process allows our clients to better manage their product development cycle and eliminate lots of spreadsheets and many surprises. The overall goal is to tailor our solution to your business process and allow you to enter data once, and have it reflect as such in the appropriate business function of the supply chain. Managing and sharing information real time is one of the greatest uses of Intellimas. Why not challenge us with your story and see how we can make your processes better?